As a defiant North Korea pushes ahead with its missile tests, one expert warns that world powers should not only be considering sanctions against Pyongyang, but also dialogue — before things get out of hand. Euronews spoke to Dr John Nilsson-Wright, Senior Research Fellow for northeast Asia with the Asia Programme at the UK think-tank Chatham House. How concerned should people on the street be about the threat of potential nuclear conflict? “I think we should always take North Korea seriously. It’s an authoritarian state, led by a man who is brutal and authoritarian in his instincts, and clearly dealing with very dangerous weapons. That having been said, the regime is rational, and one hopes other actors including Donald Trump are similarly rational and recognise that nobody would gain from military action; it would be catastrophic for all sides and ultimately it would lead to the destruction of North Korea. What responsibility does US President Donald Trump bear in this situation, in your opinion? “Clearly the primary responsibility lies with North Korea for engaging in these provocations, but President Trump has not helped matters, by putting so much emphasis on this type of rhetorical brinkmanship, threatening ‘fire and fury’ as the North continues to provoke. That threat is increasingly seen as not credible, because the military option is so unpalatable. If the Americans were to go down that route, it would have almost catastrophic consequences for the residents of SK and potentially also Japan, which would be in the line of fire from almost certain retaliation from North Korea. Beyond that, it’s the temperament of the (US) president we have to question. His willingness to lash out at America’s key regional ally, South Korea, by accusing the government of Moon in Seoul of engaging in appeasement by offering to talk to North Korea — that’s distinctly unhelpful. In addition to that, the president’s threat to tear up the US-South Korea free trade agreement is an astonishing decision undermining the position of President Moon at home at a time when he’s grappling with an extraordinarily difficult security challenge. “There’s no easy answer, unfortunately. It’s understandable that the international community has rightly pointed out that the North’s behaviour is unjustified and intolerable. It’s right that the United Nations should be seeking to convene and discuss new measures, potentially, to try and express their opposition to North Korea and perhaps try to rein in the North Koreans. 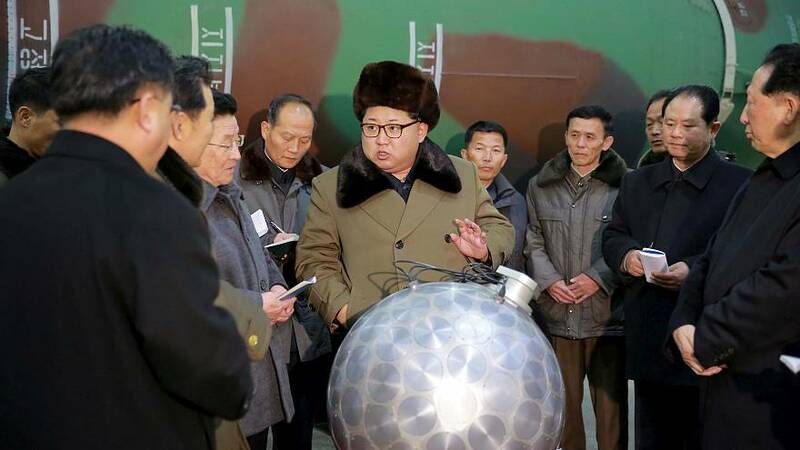 Much of that will be focused on the subject of sanctions, but sanctions are a blunt instrument and so far there’s no evidence that they’ve been effective in slowing down the North Korean attempt to advance their military programme. “Ultimately I think there will have to be some discussions with the North Koreans. In the immediate future I think that’s unlikely, given there isn’t really much will on the part of many of the principal actors, particularly the US, to sit down and negotiate with the North Koreans. But it will be important to open up channels for discussion. One hopes that at least privately the Americans are exploring this at present. The Chinese of course have made it clear that they see discussion and negotiation as the best way forward. And an imaginative and creative American president, I think, would be exploring those options.